Projects for 8 bit CPUs and MCUs. 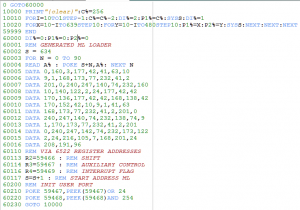 Frank on RC 2016/1 – Let’s try again! Mark on RC 2016/1 – Let’s try again! Any home computer needs at least an input device, a computing device and an output device. I plan to use a keyboard as input, an ATmega1284 microcontroller with some external SRAM as the computing device and a VGA display as output. plus several capacitors and pull up/pull down resistors. To be honest, I’m violating rule #1 here: The external SRAM is a SMD chip on a breakout board. 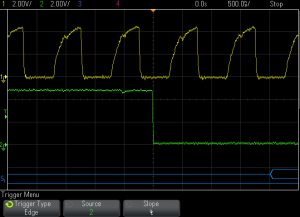 I simply couldn’t find any DIP SRAM with an access time of 40ns or less. 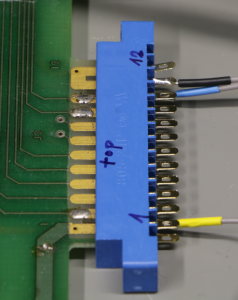 The RC2017/10 project successfully used a 55ns chip well beyond its specifications, but only when wired in a special way. The MCU is also overclocked (max. 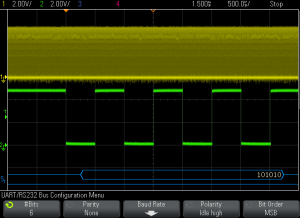 clock speed 20 MHz specified) but it runs easily at more than 30 MHz, so I consider 25 MHz to be save. before your comment gets published. What if personal computers wouldn’t have displaced home computers? What if the number of software abstraction layers wouldn’t have exceeded the number of CPU pins? What if the time to market had not been favoured over flawlessness? Don’t panic! I don’t want to start several flame wars in parallel here. 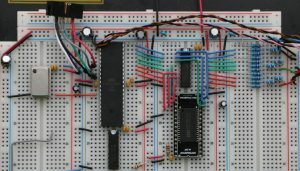 I just lack a justification for another crazy project and these questions should confuse people so that they don’t ask why (aka Captain Jack Sparrow Principle): I’m going to build a home computer from scratch – just for the heck of it. Nothing like the boring Pi + Linux + WallpaperOfMyCat stuff and unfortunately nothing like the awesome MOnSter 6502 <kneel down>. It’ll be something in between. So, what is my conception of a home computer? 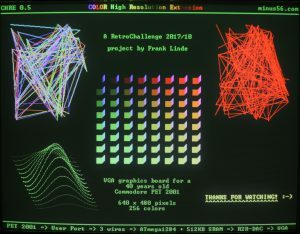 Given the limited time, what are my goals for this RetroChallenge? 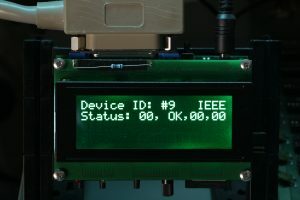 I’m toying with the idea to build a computer from scratch for ages. “No time for a project of this dimension” has been my excuse all the time. Essentially, that’s true. So, what is the point of a never ending story? Well, the journey is the reward. Seriously, there is only one goal: To get this project started! 1. Leaded components only, as I love prototyping on breadboards. As few different components as possible. As few special / highly integrated hardware as possible. All components must be available in single digit quantities. 2. Each function module in a separate circuit block. For example, video controller and sound controller will reside on separate MCUs, even if they would easily fit into one. 3. You don’t expect a home computer without graphics or sound, don’t you!!! 4. SD cards are common, cheap, robust and fairly easy to connect, so why not? 6. This is a hobby project, so I don’t have to worry about marketing. I appreciate any serious suggestion (well, most likely I’m the only nerd who enjoys this kind of endeavour, but in case you happen to be my twin from another universe, please feel free to join the adventure and give me a shout at universe42.galaxy484027.solarsystem925482537.planet3.hominids. globalcom.twitter.username: @minus56bits), but won’t implement features just for the sake of another NEW sticker. 7. Yeah, ok. You already know that this isn’t going to happen, don’t you. At least not in the course of this RetroChallenge. 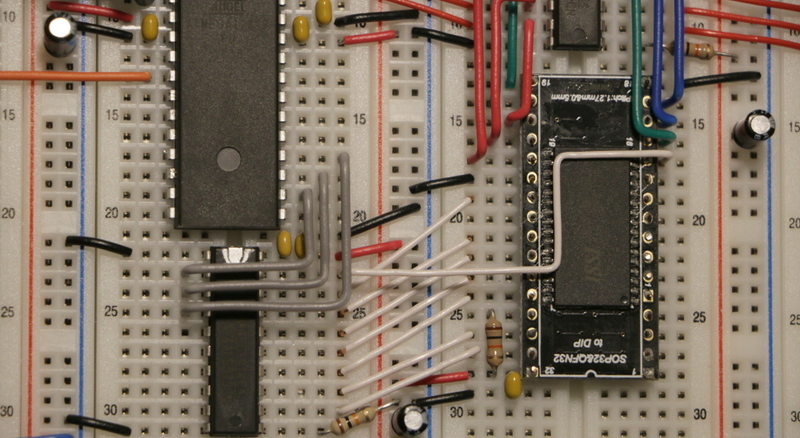 The idea is to support people who would like to get into embedded systems. One can certainly argue about whether the term ’embedded system’ is appropriate in this context, but in my opinion programming is ’embedded’ as soon as you do it on the bare metal. All of my initial goals have been achieved, with the exception of a BASIC extension. I had the hardware of the 8xxx series in mind when I wrote this goal up. Unfortunately the PET doesn’t have ROM extension sockets, so I ditched this goal and went with a simple machine language subroutine located in the cassette tape I/O buffer. Yes, the PET does have an expansion port and, as the name implies, it’s possible to add ROM this way, but that would have been a RetroChallenge on its own. I have struggled with video and pictures this time: too flickery, too bright, too dim, incorrect colors, reflections, bad sound and so on. It took me much more time to do the video than to write the demo program, to say nothing of the extreme lame data rate while uploading the video. So, there is room for improvement and a lot to learn until the next RetroChallenge. My to-do list (aka list of reasonable or silly features) seems to increase each time I work on this project. Sounds familiar? Proposed solution? K E E P O N R E T R O C H A L L E N G I N G ! Thank you for your interest! Please stay tuned (Twitter: @minus56bits). The PET series supports two tape drives, each of which has an associated RAM buffer of 192 bytes (tape I/O buffer #1 $027A – $0339; tape I/O buffer $033A – $03F9). Just for the record: Without intending to appear ungrateful I would like to point out that 384 bytes really isn’t a giant amount of RAM, thus I’ll start with a basic version of the API and maybe add convenience later – at the expense of BASIC RAM. Warning! Doing this may have serious side effects such as long-lasting headaches! A BASIC integer variable is stored in 7 bytes. 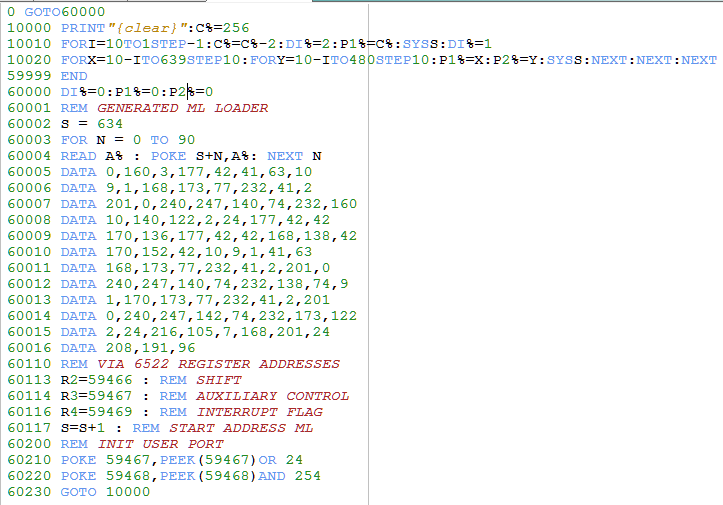 Bytes #0 and #1 contain the name and type of the variable, byte #2 the MSB and byte #3 the LSB of the 16 bit value. Bytes #4 to #6 are not used. Yep, Billysoft looks back on a long tradition of wasting RAM. BASIC stores a pointer to the start of the variables at address 42/43 ($2A/$2B). Please note that variables are stored in sequence MSB/LSB and pointers are stored in sequence LSB/MSB. Yep, Billysoft looks back on a long tradition of confusing people, too. 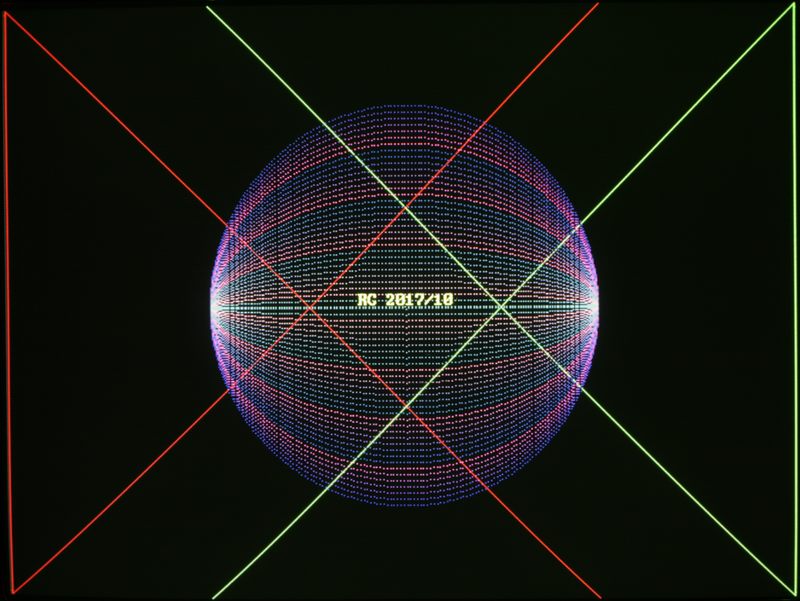 Lines 11-12: The subroutine’s entry point is labeled ‘start’ (address 635 / $027B). Indirect indexed addressing is used to fetch the LSB of the first variable (aka drawing instruction). Backup result in register Y. 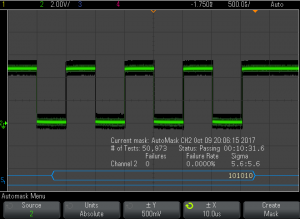 Lines 21-24: Serial communication is a low priority task on the CHRE side, so we have to check if CHRE is ready to receive before we start the transmission. Line 27: Data is transfered to the shift register. Shift out starts immediately. Line 29: We ignore the MSB just to show Goliath that David can waste even more RAM and set the index to LSB of the second variable (aka parameter #1). Lines 47-49: Do you remember? Line 48a: At this point the developer realizes that he missed to mask bits #6 and #7. Bad for his ego, but great to check if John really reads all this. Assume that the developer will insert an AND #63 here. Lines 52-58: As stated in the comments and discussed above. Backup result in register X. Lines 67-73: As stated in the comments and discussed above. 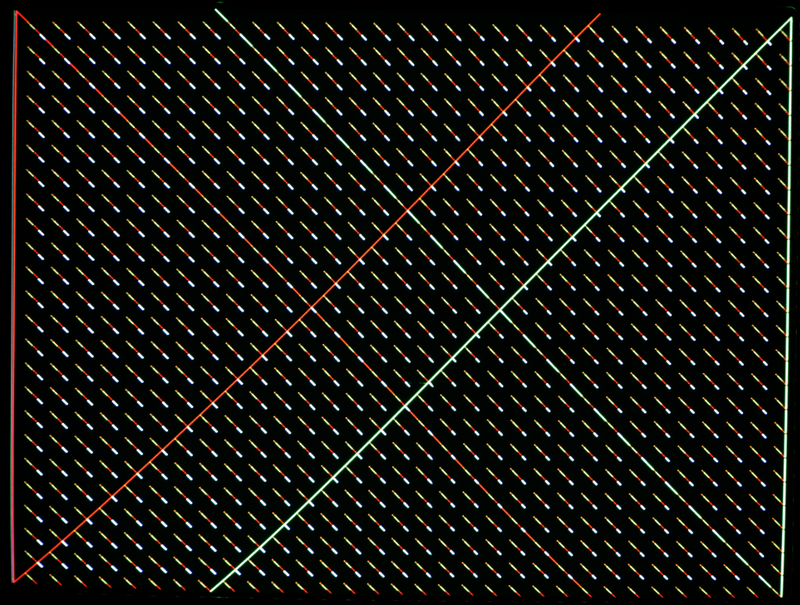 Lines 76-82: Restore index and add 7 to point to the next variable. If index is not equal to 24 goto label ‘loop’. Line 83: Make an educated guess! The following BASIC program is used for the performance test. I compressed several statements into a line and removed any spaces to make it as ugly as possible – and to squeeze out the last ounce of performance, but apart from that it should be quite self-explanatory. 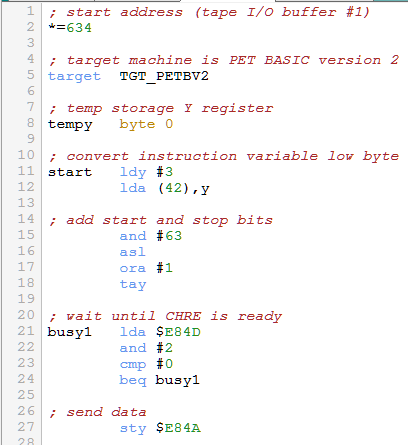 This BASIC program as well as the machine language subroutine have been programmed with CBM prg Studio (designed by Arthur Jordison). Thank you very much for providing this software to the community, Arthur! Data is sent in the order Xhigh, Xlow, Yhigh, Ylow, Chigh, Clow. There is no function identifier transfered to keep it as simple as possible for the moment. 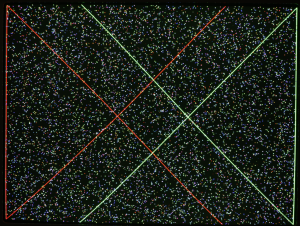 Therefore the CHRE executes always the SetPixel(x,y,c) function to draw a single pixel at the coordinates x,y in the color c.
I’m very happy with the result. No missing pixels, no pixels out-of-line. It took ages to render this image at a rate of 5 to 6 pixels per second. That was to be expected, though. BASIC is way too slow for this task. For the final version I’ll write all communication related code in Assembler. I had a nightmare last night. The oscillogram of the phase2 clock (see previous post) turned into a nasty saw and cut the mainboard of my PET in half. I definitely should go and find the cause of this weird thingy that pretends to be a rising edge, but that investigation might take a while longer. To get on with the main project, I’ll mimic the PET’s own pragmatic way for a moment: Ignore! Business as usual! Have you ever experienced the resolution cancellation phenomenon? No, I’m not talking about politics here. What I mean is: You start with the intention to write a serial communication protocol, but get distracted by some other code as soon as your IDE pops up? I went down the rabbit hole of performance optimization. Yes, I know the rule. Don’t optimize your code in an early stage! I just couldn’t resist. Provided that I did count accurate, the screen content is built up of 153,728 pixels. 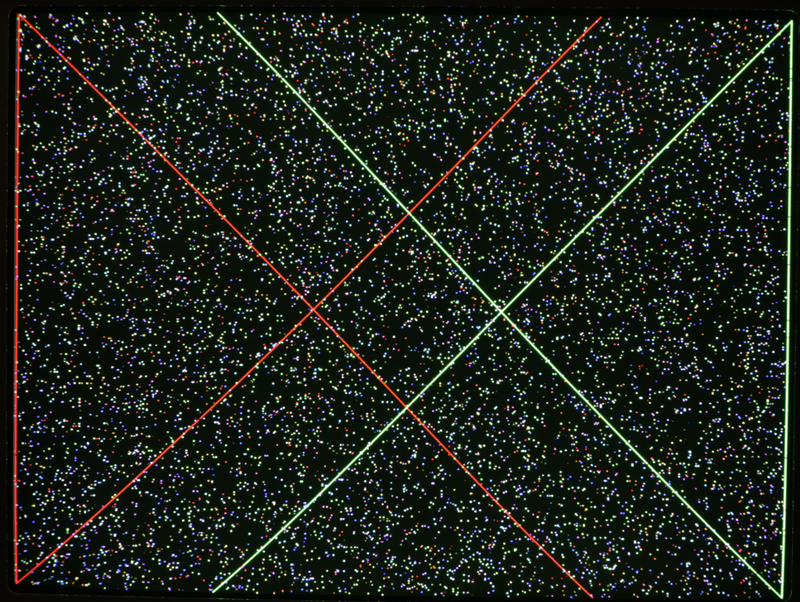 153,728 pixels divided by 16 seconds equals 9,608 pixels per second. 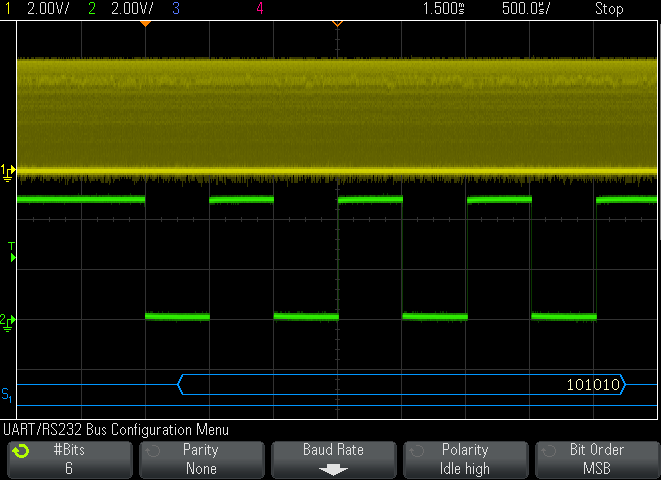 Back to serial communication: Drawing a single pixel is the most basic function the CHRE has to provide. 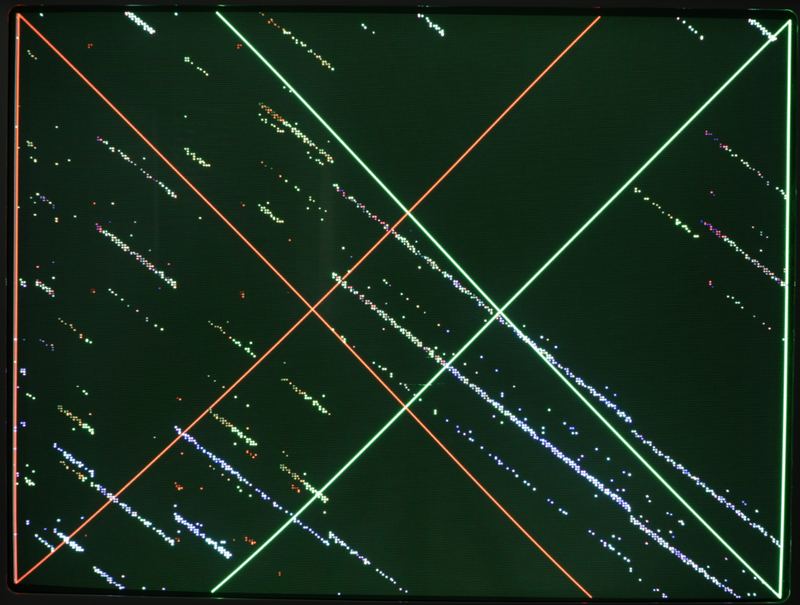 And it’s the worst case in terms of the communication protocol as well: Only one pixel per function call. How many DrawPixel function calls can we transfer over the serial link at a bit rate of 250 kbit/s ? 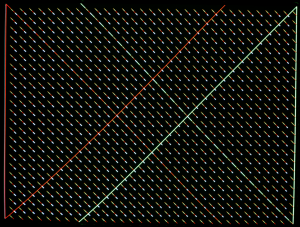 2 frames color (using only 8 bits out of 12). These seven frames correspond to 56 bits (start and stop bits included). So we can transfer 4,464 frames per second (250,000 divided by 56). That’s insufficient, isn’t it? Well, it depends. The CHRE pixel rate is already very slow. 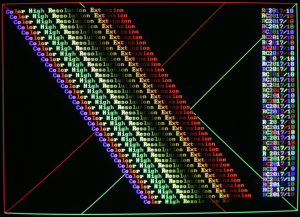 The ATmega is currently using nearly all of its processing power to handle the framebuffer and do the rendering. We’ll have to steal some clock cycles from the rendering to implement a serial protocol, hence reduce the amount of pixels the CHRE can render per second. Another aspect is the real application. A few thousand pixels per second may be adequate if the PET does analysis of a math function and curve sketching. A 3D ego shooter is out of reach, though. In addition to the IEEE-488 bus the Commodore PET/CBM series features an 8-bit parallel interface named Userport. A single 6522 Versatile Interface Adapter (VIA) provides bidirectional I/O lines, two 16-bit timers and an 8-bit shift register for serial communications. The monochrome High Resolution Extension (RC 2015/07) used a parallel protocol for Userport communication. 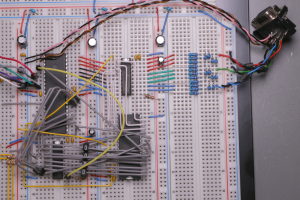 In theory we could use it with CHRE as well since there are eight free I/O pins left on the ATmega (four pins of the programming header included). 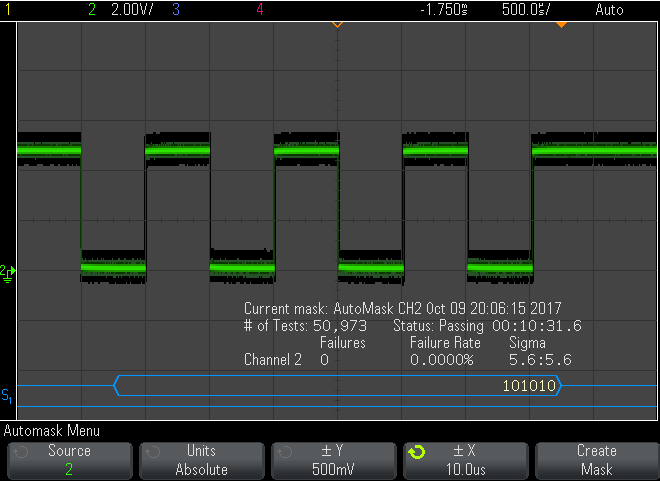 But I hope to keep a few extra clock cycles on the ATmega if I use its USART (Universal Synchronous/Asynchronous Receiver/Transceiver) hardware support for serial communication. For example, it took nearly ten minutes (!) to render the screen content that I posted the other day. Granted, there is room for firmware improvement, but it definitely makes sense to be picky about the use of clock cycles. b) the creature in front of the scope made a suboptimal decision. … It’s b). Using 8 bit data wasn’t clever. 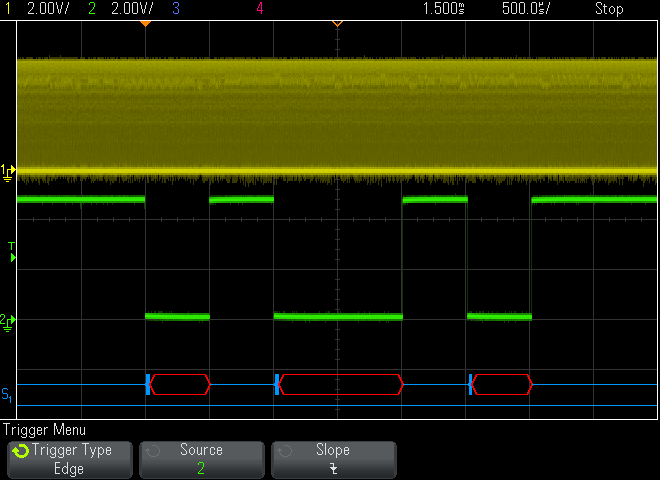 The shift register in this VIA is just an 8 bit shift register, no complete UART/USART. It does not send a leading start bit and does not send a trailing stop bit either. 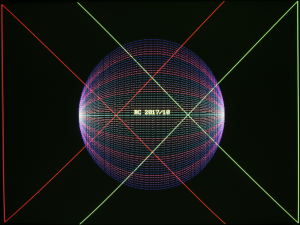 Without a start bit the scope cannot detect the beginning of a frame and therefore cannot decode the bitstream. A slight modification to the BASIC program reduces the usable data length to six bits. The answer to all questions is stored in variable D (binary 00101010). We multiply by 2 (result: binary 01010100) and add 1 (result: binary 01010101). 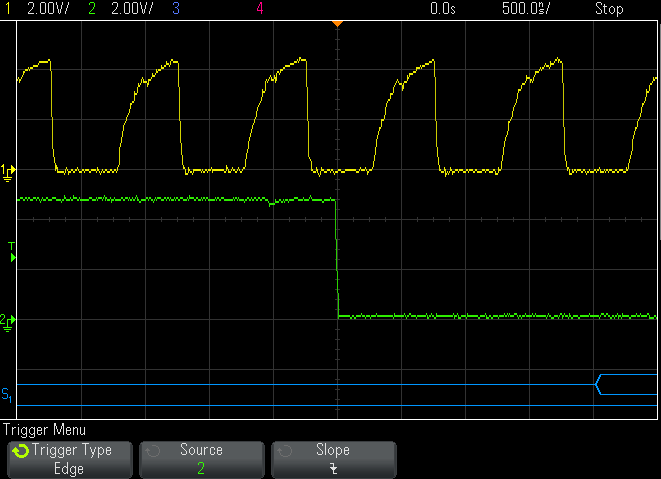 The MSB is now zero (aka start bit) and the LSB is one (aka stop bit). 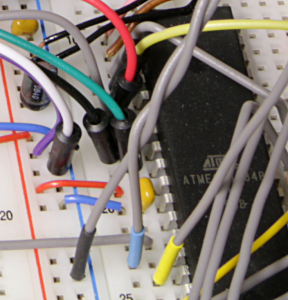 The position of the components on the breadboard is roughly reflected in the circuit diagram. VGA synchronising is handled by PB0 (horizontal sync, pink wire) and PB1 (vertical sync, brown wire). 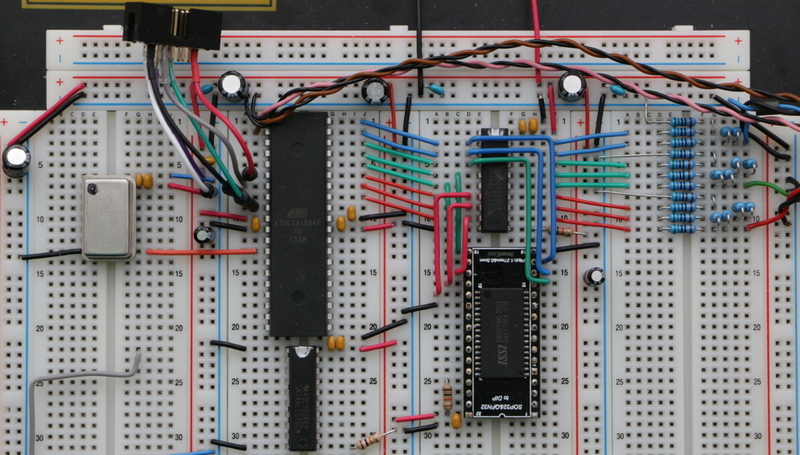 Latch U2 separates the pixel data bus (Color0..7) from the digital to analog converter during the blanking periods when the microcontroller sends pixel data from Port A to the SRAM. U2 is controlled by PD6. SRAM read/write mode is controlled by PD4. The address bus is partly multiplexed. PB2 selects the most significant address bit (Addr18). PB3 switches latch U3 into transparent mode, then Port C puts address bits 10 to 17 on the bus, then PB3 switches U3 into latched mode, then Port C puts address bits 2 to 9 on the bus and PD7 / PD5 deliver Addr0 / Addr1. While streaming pixels from SRAM to the screen Port A is in high impedance state and U2 in transparent mode. Three simple R2R resistor ladders convert the digital color information into analog voltages. Eight shades of red, eight shades of green and four shades of blue make 256 colors in total. RC 2017/10 – MARVEL !!! Please excuse the lurid headline. I’m overwhelmed with emotion! I was already soooo close to the ultimate goal at the end of spring-time RetroChallenge – but couldn’t see it! This evening, while exploring sourcecode and breadboard circuit for the first time after several month, the scales fell from my eyes! 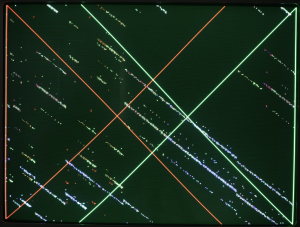 After some minor changes this really simple circuit now displays 640 by 480 pixels at 256 colors on the VGA screen!! !